Richeson offers a variety of traditional palette shapes in two surface options. Some painters prefer to work from a traditional wood palette while others prefer a melamine-laminated surface that is easily cleaned. 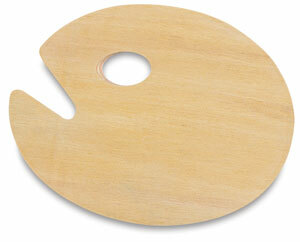 The melamine-laminated models feature a neoprene thumb insert for a more comfortable grip. Both styles are offered in a variety of sizes to suit the painting needs of all artists. The palettes are 3/16" (5 mm) thick.